Peanut…butter….maple….syrup. Yep, I put these two together, and it was amazing, and now I’m going to share it with you guys because you also deserve to taste some amazing. You know, some of my favorite recipes are those that are completely unplanned. The ones that kinda just….happen. This is one of those that just happened, and I’m oh so glad that it did. I was whipping up a batch of some of my favorite healthy blender pancakes (recipe coming soon!) when I hit a mini dilemma. I was getting ready to top my pancakes off with a little dollop of Greek yogurt and some honey but my taste buds just weren’t feelin’ it that morning. I was in the mood for some peanut butter. Some serious PB cravings were happening and I had to take care of them before things got ugly. So, I reached for my PB Fit powder and proceeded to make some peanut butter to spread on top. Side note: have you guys heard of PB Fit Powder? If so, isn’t it amazingggg?! If you haven’t…I’m so so sorry *pats on the back*, you have been sheltered from one of earth’s greatest inventions. For peanut butter lovers like myself, PB fit has literally waltzed in with a cape and saved us from having to miss out on the joys of peanut butter because of the high calories it contains. You basically take 2 tbs of the PB Fit powder, mix with a little water and you have a magical, low calorie peanut butter spread. Truly mesmerizing. 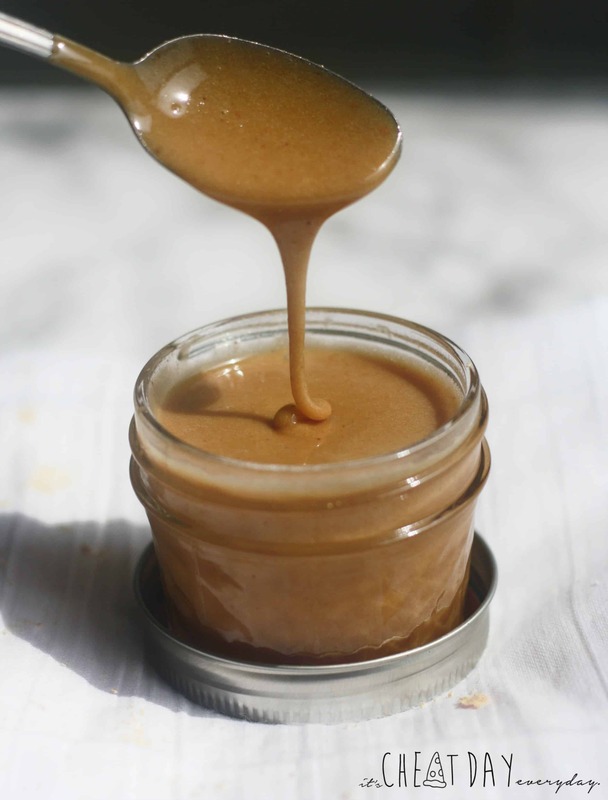 In a small bowl, combine maple syrup and PB Fit powder until no more lumps remain. Store any unused topping in a mason jar or airtight container and refrigerate. I don't think that I could ever part with PB maple drizzle, it's just too good! But thanks for a cool alternative!